By this time of year, most of the major summer tours have been announced, but we have a new one on our hands. Fueled By Ramen bands Dashboard Confessional and All Time Low have announced a North American co-headlining tour of clubs and theaters set for this August. The first leg of the tour, dubbed The Summer Ever After Tour, will kick off Aug. 3 at St. Paul, Minnesota’s Myth Live and run through an Aug. 26 date in Asbury Park, New Jersey, and Stone Pony Summerstage. The first leg of the trek will feature special guest Gnash. A second leg of The Summer Ever After Tour is expected to be announced in the next few weeks. Tickets for the shows go on sale to the general publish starting at 10 a.m. local time Friday (May 18). Pre-sales will be run by Spotify and Citi. 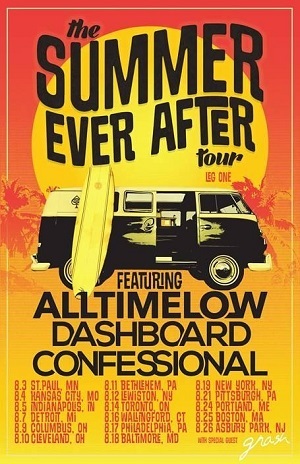 For full ticket details and addititonal information, visit Dashboardconfessional.com and Alltimelow.com. Dashboard Confessional is on the road in support of their first album in more than eight yeras, “Crooked Shadows.” The album includes the hits “Heart Beat Here” and “”We Fight.” All Time Low is touring behind its latest album, “Last Young Renegade,” which marked the band’s fifth consecutive top 10 album on the Billboard 200 chart. All Time Low will also appear at Lollapalooza this year.